Light: A Tale of the Magical Creatures of Zudukii, by T. S. McNally – book review by Fred Patten. Light: A Tale of the Magical Creatures of Zudukii, by T. S. McNally. Syracuse, NY, Bounding Boomer Books, February 2015; trade paperback $9.99 (151 pages), Kindle $4.99. “Garoo didn’t know how to respond to that as he leaned his ears back, a bit sheepish at how blunt his friend was about the relationship between him and the otter. There was another laugh heard which caused both of them to be startled. They soon identified the creature who laughed as Bomeran, who stood next to a flustered Kareen. ‘Honestly that was not my intent, but I suppose it is a possibility.” the deer gives a smile which only causes further embarrassment for Kareen and Garoo. 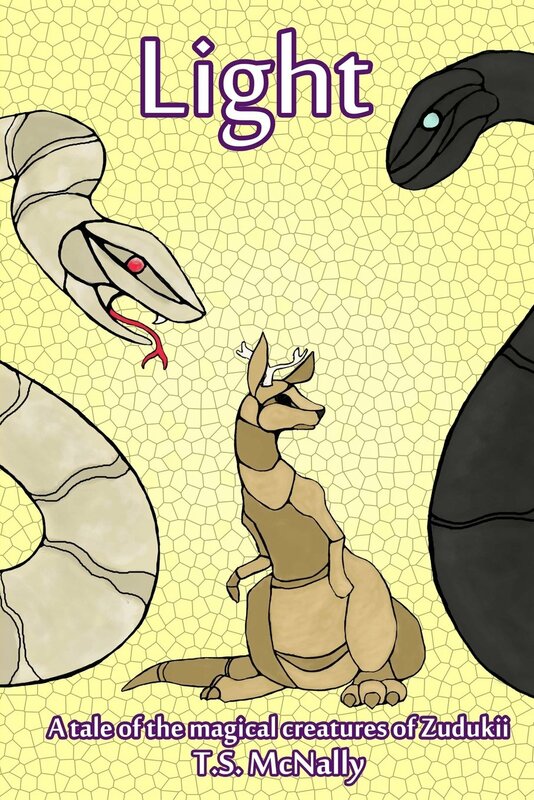 T. S. McNally is a frequent contributor to Flayrah under the name Sonious, depicted as a kangaroo. If all his fursonas are put together, you get Tantroo Sonious McNally; but that’s still only a fursona. But it’s an active one. He has written short stories for furry anthologies, and this is his first novel. I would like to start by thanking you for taking the time to review my story. I know I’m breaking a cardinal rule by commenting upon a review of one’s own story. However, to me, that ‘rule’ exists because many cannot take critique very well. 1) The first and well known one is they provide a chance for consumers to hear someone’s take on the quality and content of the work. This in turns helps to aid them on if it’s worth the current investment asked by the creator. It is to improve the consumer. 2) The second, and less well known (and ironically probably the most important) is that they give the creators themselves a bar to reach for. It shows them in the must blunt and unflattering terms what works and what does not. It is to improve the artist. That being said, review itself is not an science either. It is important for the content creator and consumer to know the nuances of each reviewer. Particularly if their preferences mesh with their own. I knew aspects of the story did not mesh with the nuances and preferences of the reviewer even when I sent the copy to the reviewer and expected the peeves presented in the first 4 paragraphs. What I didn’t expect, and I think is more important for me as a take away was the stuff that came later. I was pleasantly surprised that the plot was enjoyed as indicated by paragraphs 5 – 6. However, I was unpleasantly surprised by the remainder of the review in which an inexcusable and grave error I had committed was laid to bare. There is no reason any person asking for money for their works should allow errors presented here to be present within their published work. Independent publisher or not. All too often I’ve seen independents (in game design or book publishing) whine that it’s unfair, that they are one person doing the work of what a team used to do. However, if they want to be taken as seriously as the main stream publishing houses, they need to start to accept the same reviewer treatment that is given to the big boys. While I do have a copy editor and we did fix many of my grammatical issues, it is clear that too many slipped through. In the end though that is my fault, not her’s. I was the one who hit the publish button. I was the one that did not mail a physical preview copy for 10 bucks to have reviewed prior to hitting the publish button. That is my error to take on. In the future you can bet I will be doing just that before even thinking of asking the general public to put a dime towards my work. That final double check on the whole of the story should have been part of my process. But there is good news here. Since no copies have been sold of this book as of yet (Only 2 physicals exist in the world right now and zero digital) there is no reason for me not to clean this up and only have the experience of gritting one’s teeth be experienced by the reviewer. No one should have to grit their teeth for the sake of enjoying a book. I will be working with my copy editor further to fix all these issues and “republish” the internal document to be cleaner and better. I will comment here when that is finished, but until that happens I would suggest those interested wait. While some may see that as “cheating”, particularly in a medium that was set in stone as publishing once was. Where when one published they had hundreds of books that could not be changed out there. I think more and more the old media is adapting the policies of the new media. The ‘print-on-demand’ makes it easier to fix problems on a book when the demand is lower. In an odd way the non-existent demand for my book mitigated the damage that could have been done had hundreds been sold with the errors within them. Right now there are no customers I have to provide free books because of me fixing these errors. In the future I may not have that luxury, so it’s important to take that lesson now. Books have versions just as games and movies do. If this were a video game review it would basically be “The game is enjoyable, but there are some immersion ruining bugs that drag it down”. At the time the review is accurate, but if the developer is doing their job, they’re going to be patching those bugs post-review. And so it is my job to patch the bugs presented here. Especially since the review indicates there is a story worth polishing here. Thank you Fred for doing your part to help me create a better product. Eh, it sounds like mechanical stuff, not a deficit in creativity, wouldn’t worry too much 🙂 I tweak published articles here fairly often… fix a broken link, add a small line to bridge a gap in ideas, or whatever. I think you’re supposed to avoid doing that, but I don’t think anyone notices and it only smooths new views of old things. I have said before that one of the most unfortunate aspects of reviewing a print-on-demand book, and certain others, is that a reviewer can point out many errors in a review copy — traditionally one of the first printed — and they can be corrected by the author immediately. This results in a book free of spelling and grammatical errors, and with any errors of fact gone; yet the review complaining of many of those — often the only review — remains. This is a unfortunately side effect of reviewing anything and it is not unique to print on demand books. I’m sure I could find a print of a Star Wars review before it was called “Star Wars: A New Hope”. Does that mean the movie reviewer in the 70s wasted their time by reviewing it because Lucas would later re-realease the movie with changes years later? The only difference is that these changes are happening more and more rapidly. This modern generation is well aware that they need to ensure that the information they have is the most up to date out there, and in a mere 24 hours the information landscape changes pretty swiftly. That’s another reason why I commented. So that way those that read the book after reading the review would not be confused when they didn’t find the errors highlighted here. It would certainly be a bit asinine for an author to secretly remove errors presented by a review and then act like they never existed. I’m sure to hear stories like that in the future for sure. I’ll be sure to add “Revised First Edition” to the info page of the new one (Though I do not believe I put “First Edition” on the info page of the original, so that was a bit short sited on my end). And worry not, I have absolutely no plans to change anything that was not grammar related, most of the review will still be relevant. Going back to my opening example: Fangstro will always shoot first! May I request a copy of your Revised First Edition, too, when it’s published? That is a reasonable request. I will send it to you when it is prepared. I enjoyed trading some personal messages with Roger Rabbit creator gary wolf, following freds review a few days ago. We talked about digital publishing and i wish i could share but it was personal. However he offered to contribute to an article. Would you guys like to collaborate on one? I feel it would be better handled by you than me- perhaps sonious handling the digital part and fred comparing the trad part, collecting info or quotes from others like gary. It could be aimed to inform furry writers. If you message patch.ofurr@gmail i can connect you. Fred on a side note… if you see a chance, let others know i have a standing idea to support a “furry coffee table book”. I dont feel i could lead it (due to scale and things like book layout that could call on others expertise) but i could at least 50% support with a lot of resources to contribute. Okay – why not? Let’s see what you, Tantroo/Sonious, and Gary have in mind. My e-mail address is public; fredpatten@earthlink.net. I’m working now on a 200- or 300-page history of all furry conventions around the world from 1989 (ConFurence 0 in January 1989) to the present, but it’ll only cover the highlights of each. Someone else should write an in-depth history of each. The first revised edition is ready to be sent. Should I send it to the same address as before or has your address changed since sending you the first? If it has go ahead and private message me on Flayrah. Sounds interesting. If a revised edition, with the writing errors fixed, gets released a few years later, someone please review it. By that time I will have enough free $$ to buy it.